Sheila On 7 Ready "Menentukan Arah". After about two years no longer heard his throbbing music in the world, national, was on 16 May 2008, Sheila On 7 will do the pre launching the latest album titled "Menentukan Arah". Album-6 band origin Jogja This can be launched at this year because of the materials and production, this new album can be completed this year. In addition, within two years, the Sheila On 7 can also create a new album so that more fresh for their fans, SheilaGank for music and Indonesia. "The materials and production, songs on the new album this can be resolved this year. So yes it releases this year. Besides, the two years we will mambuat music more fresh," said guitarist Sheila On 7, in a press conference Eross in Caesar Cafe & Resto (14/05). 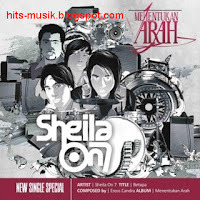 In addition to the title is one of the songs in this new album, "Menetukan Arah" is the determination of Sheila On 7 in determining the direction in the world playing their national music industry. Content on a new album Sheila On 7 is music that will serve more fresh from the previous album. One is the emergence of sound changes on this album because the production process up to the sound recordings made by Sheila on 7 alone without a sound engineer. "On this album, songs Sheila On 7 will be heard more fresh than the previous albums. What will change is the sound on this album, because it no longer uses the sound engineer, but we own that produce it", said Adam. For this latest album, each personnel Sheila On 7 truly have a large portion of the production process. Eross, Ambassador, Adam, and Brian use to process their own aransemen to rekamannya. "This album is the album's self-reliance. From processing, aransmen, to do our own recording," said Brian the drummer. This year is the year to 12 for Sheila on 7 present in the national music scene. With the addition, the band was called the phenomenal bands because sales above 1 million copies for the three albums they will hold a concert pre launching the album "Menentukan Arah" on Friday, 16 May 2008 in Caesar Cafe & Resto starting at 22.00 PM. A day earlier (15/05), there will be a "Tribute Concert to Sheila On 7" which will display the original band, Yogyakarta, such as Cross Bottom, Kapas, Endank Soekamti, Bre, New Days, SKJ 94, and Zen which will appear sings songs Sheila On 7.